I’m not going to say these are fully comparable, but it does make me wonder why we hear so much about Iraq and relatively little (to nothing) about Mexico, Colombia and the other Latin-American countries’ War On Drugs-related deaths. Iraq: between 106.000 and 116.000 civilian deaths between 2003 and now. Roundabout 12.000 deaths a year, tailing off recently. Mexico: around 220.000 deaths since 1990; or 50.000 deaths since 2006. Pretty much exactly 10.000 a year, constant even over last 5 years (if not rising, to over 15.000 in 2010 according to this source). Colombia: around 450.000 (!) deaths since 1990. Astonishing. Colombia does have a larger population 46 million; Iraq’s is around 30 million. Mexico is quite a bit bigger at over 110 million (all from Wikipedia). The questions that I have then, are: why don’t we hear much more about the carnage going on in Latin America (fortunately the local leaders are starting to push back against the US); does it not bother the US that actually more people are getting killed on their doorstep than in that far-away country; and will the US ever learn not to try and fight costly holy wars against what it perceives to be evils, and instead turn to more cost-effective – more effective full stop, really – ways of dealing with their problems? I’m not holding my breath. I was one of the million+ people that downloaded Instagram when it became available for Android. I wasn’t even to fussed but some of my friends raved about it. Then, before I had even used it once, it was bought by you-know-who for you-know-how-much. And I happen to totally not trust Facebook with regards to privacy and copyright, no matter what they promise about independence and bla. So, alas Instagram…bye-bye. You have been uninstalled. … the religious themselves are. A fair amount has been written lately about the ‘militant secularism’ remarks by baroness Warsi. I won’t waste more time dispatching of these stupid and bigoted ideas, as this has been done convincingly by others already. 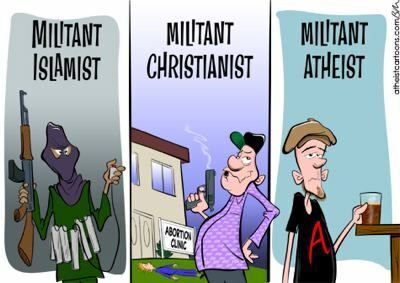 Suffice it to say that if current secularists and atheists are seen as ‘militant’, then students, NHS staff, London underground drivers, and members of the Scottish Labour Party, to name but a few, must be deemed positively terrorist – what with like, taking to the streets and protesting en masse, or demanding things. The temerity! Why is this realisation important? Because is this discussion the religious (mostly the christians) make it appear that it is the atheists/secularists (NB these are of course not the same at all, but the distinction is usually lost upon the frothing-at-the-mouth antiatheists) who are forcing the believers out of their churches, taking their bibles away, and thereby effect a decline in religiosity. Of course, nothing could be further from the truth. The only people that can make christians stay away from church, are those that attend in the first place. The only people that can unregister from a church’s membership are those that are a member to begin with. As was once said wittily but truthfully: “If people don’t want to come out to the ball park, nobody’s gonna stop ’em” (Yogi Bera) – the inverse applies here: if people wanted to go to church, no atheist is gonna stop them. As indeed christians are making that decision for themselves, blaming outside forces is silly. The question that people like Warsi forget to ask (conveniently and deliberately, because to put up a strawman enemy and attack it is so much easier than confronting your own failures as a religion, political movement, or public figure), is why this is happening in the first place. If outside pressure is to have any credit, the most likely explanation, then, is that the arguments put forward by secularists and atheists are seen as increasingly valid, and the religious are acting upon this. And if there were no truth in these arguments, I don’t see the problem the church has – all it has to do is simply indicate where these arguments are flawed, and people will start coming back to the churches. Well, I say – good luck with that. On a side note, and despite loud claims to the contrary, most mainstream media are still overwhelmingly biased towards religion, so to think that people are giving up their beliefs because they are ‘bombarded’ with anti-religious messages, is simply insane. If anything, religious people are on the whole surrounded by reinforcing, yay, indoctrinating, messages, constantly reminding them of how awesome their beliefs are. The fact that atheist messages come through at all, and are even accepted as valid, says a lot about the relative merits of the arguments either side puts forward. However ‘militant’, in loudness of arguing, there still is no contest between atheism and religion. Also, of course, the continued failings of every major religion are not helping their own cause either, being in turn (or simultaneously) backward, stubborn, wrong, and downright criminal. In this age of internet and fast-spreading news, religion is its own worst enemy – ‘with friends like these, who needs enemies‘. In short, instead of incessantly trotting out the ‘loud militant bad’ canard, the conservative right slash christian defenders of the faith would be better off asking themselves some tricky questions about exactly why christianity is increasingly seen by its own members as non-viable. Whether they do or not, and whatever answers they find if they do, the outcome to me is likely to be the same regardless. Lately the lower echelons of the right-wing press have been busy ganging up on Richard Dawkins. Probably because, hot on the heels of a defeat in court, christianity in the UK was put further on the back foot by an interesting and thorough poll by Ipsus Mori, showing that there is no such thing as a vast christian majority in the UK. We all know how much our right-wing newspapers love to cozy up against religion, giving them the sheen of righteousness (while actually being rather vile and scummy, if you have been following the news about phone hacking, amongst other things). Anyway, Richard Dawkins has been targeted by the lowlifes in the tabloids, which is no surprise and can be ignored fairly easily, but this slur in a ‘normal’ newspaper is a new low. And to elaborate on why this is the act of a cowardly journalist, supported by a cowardly newspaper? Well, first off, there is no comments section. Probably because they knew that was going to be filled 90% with support for Dawkins and rage against the writer of said shite. The newspaper also dared to file it in the “UK > News” section, which seems very charitable given the non-content of the article. Secondly, it would have been nice if the writer had done similar research into his own family history and shown a perfectly pristine clean sheet. Having said that, even with such an inclusion the point made would not be valid, as nobody alive can be held responsible for what their ancestors have done. We’re not talking about just slavery of course, but about witch-hunting, repression of women, supporting genocide, and suchlike. Then there is the problem that Richard Dawkins is a fairly low-profile figure, compared to, say, the current PM, a few archbishops, and most of all the Queen. I daresay that within their families there are quite a few more skeletons in the closet than Richard Dawkins’s relatively modest one. Why such fuss about him? Well, we know why, see above. And finally, on the same level but much more recent in history, there are literally (tens of) millions of Germans alive today that descend directly (as in, one or perhaps two generations) from a population that helped initiate the largest war in the 20th century as well as one of the biggest genocides of all human history. I do think we’ve all gotten over that one and realise that the generation(s) of Germans alive today is (are) not responsible for this. So, for all the above, I say that Adam Lusher and The Telegraph are lowly cowards. And, unlike them, I do have an open comments section.